Leonard Cohen turns 80 this year and book publishers have taken note, issuing a large crop of books about the one-of-a-kind singer/songwriter. The volume you should run out and buy first, of course, is my own Leonard Cohen on Leonard Cohen: Interviews and Encounters. 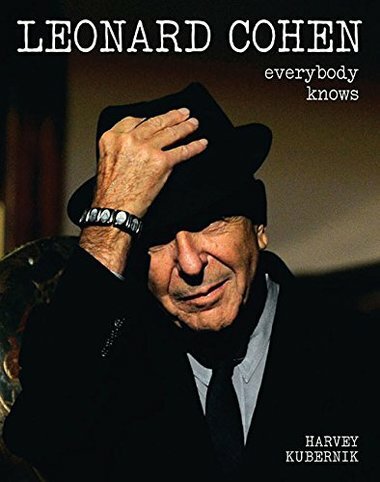 After that, though, you might want to pick up Leonard Cohen: Everybody Knows, by veteran rock writer Harvey Kubernik. Kubernik—who contributed an interview from Cohen’s Phil Spector period to my anthology—has delivered a handsome coffee-table book, featuring high-gloss, oversized pages and lots of well-chosen, beautifully reproduced photos, many in color. Seemingly designed more for browsing than for reading from front to back, Everybody Knows is a grab bag of memorabilia and information. You’ll find incisive commentary from the author; memorable anecdotes and insights from the singer’s friends, associates and critics and Cohen himself; a detailed timeline of the artist’s activities over the years; and an exhaustive 18-page discography that includes compilations, singles, guest appearances, DVDs, and tribute albums. Though many of the quotes are fresh, quite a few have been pulled from previously published sources, and a lot of the photos have appeared before, too. Nevertheless, Kubernik has done an excellent job of pulling everything together and this is a noteworthy book that Cohen fans will likely find hard to put down.